Hello and welcome to the new design of resources.blogscopia.com. As you can see we have wordpress as CMS now, and you can vote and comment every model. We hope you like the new interactivity of the site. Every zipped file contains the license that you can find here too. Basically you can do anything with the files. The only limitation is redistribution without attribution to Scopia. All the files are modeled with Blender, then we export they to 3DS and OBJ with UV coordinates. We use Sketchup too and some files can be downloaded with its format (skp) and in Google Earth’s format (KMZ). 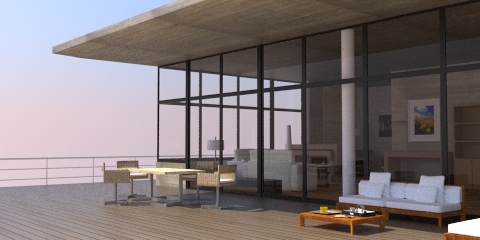 We used Yafray as renderer, and the materials’ setup are optimized to use with it. But in some files you can see that we use materials with Indigo’s and Yafaray setup. Look at the files legend. The new models will be availabe in sh3d too. 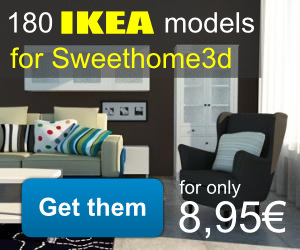 This is the format file of sweethome3d. You can import .obj files into sweethome3d too, but maybe the textures will be wrong if the model is old. This site will be updated with new models periodically (once a week). Subscribe to our RSS to check the new models. I am new to Blender and 3d modelling in general. I have a question about free models such as yours and “creative commons 3”. I draw cartoons (2d) as a hobby but now I want to branch out into 3D. If I setup a scene with models of furniture with my own 3d characters, then render the scene as a jpeg, do I still need to somehow attribute back? I’m a little queezy about copyright issues; I recently drew something something using another cartoonist’s image as a guide, but he felt the resemblance was too close and basically chastized me and threatened legal action…. all over a chicken! Thank you very much for share your work. I am developing a simulation with ogre, and I need to model the scenario. I’m using blender with a script to export the models into the .mesh and .material files. Can I use these (yours) files (models)? and what about the license, how I handle it? Do you think it would be nice to be able to put 3D models inside a web page and allow the user to navigate in 3D around your model. Blender has an Export to X3D capability and I tried it with one of your models. You can see the result as demo35 in this 3D gallery. Just drag and click your left mouse button to move around in the 3D scene. I use Java to display 3D in a web page so you might want to check that you have a current version of Java on your machine. Do you think that this is useful to put 3D in a webpage? Is this something you have tried before or even considered. Any feedback would be appreciated. Anyway thanks for your links, they are very interesting!! PS: Your page gives me an applet error (Unable to start Xj3D Applet). I use Ubuntu 10.10, with firefox and chrome, with sun-jav6-jre instead of openjdk. X3D is the ISO standard for 3D on the web, and blender has an Export to X3D functionality built in. You can find out more about X3D by visiting the web3d.org website. I used Java to implement X3D and display it in a web page. The link I provided was tested mostly with Windows and OSX operating systems and works fine with the current version of Java. I also have an X3D implementation based on webgl that is a work in progress. Here is another lite version of the applet for you to try to see if you can view the your blender models in a webpage. Just click on Sample1 to Sample6 to see a different blender model in the webpage and then left click and drag your mouse to navigate in the 3D scene. Good to hear that it worked on your ubuntu 9.04 machine, I will look into the problem with Ubuntu 10.10. Did the first link with the 3D Gallery work on your ubuntu 9.04 machine? I have been told that it worked perfectly with Debian (Linux), but I don’t have a linux machine to test it on. Right now I am trying to identify and get fixed any bugs with Blender 2.5 Beta’s Export to X3D functionality. When I report a bug they usually get on it right away and fix it. I want to get it working properly before blender 2.5 get’s out of Beta. So if you have any architecture related blend files with CC license that I could use to test, that would be much appreciated. Maybe a sample file of something like this picture from your website. let me know if you have something like this on your free model list.